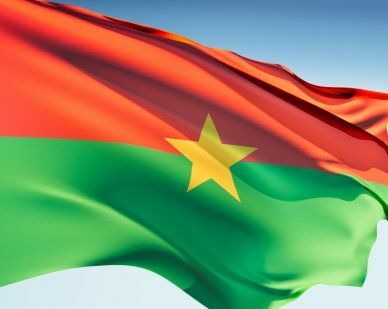 The flag of Burkina Faso is made up of two colors, green on the bottom and red on the top. A five-pointed yellow star is featured in the center of the flag. In 1959, the flag was made up of three horizontal stripes of black, white and red, like the German imperial flag that became obsolete in 1918. The old name for Burkina was Upper Volta. In 1984 the flag was changed to the version we know today and the country’s name changed to Burkina. Our top-quality Burkina Faso flags conform to all official specifications. Emblems and designs are executed with the highest possible degree of accuracy in regard to detail, color shades, placement and proportion to flag size.